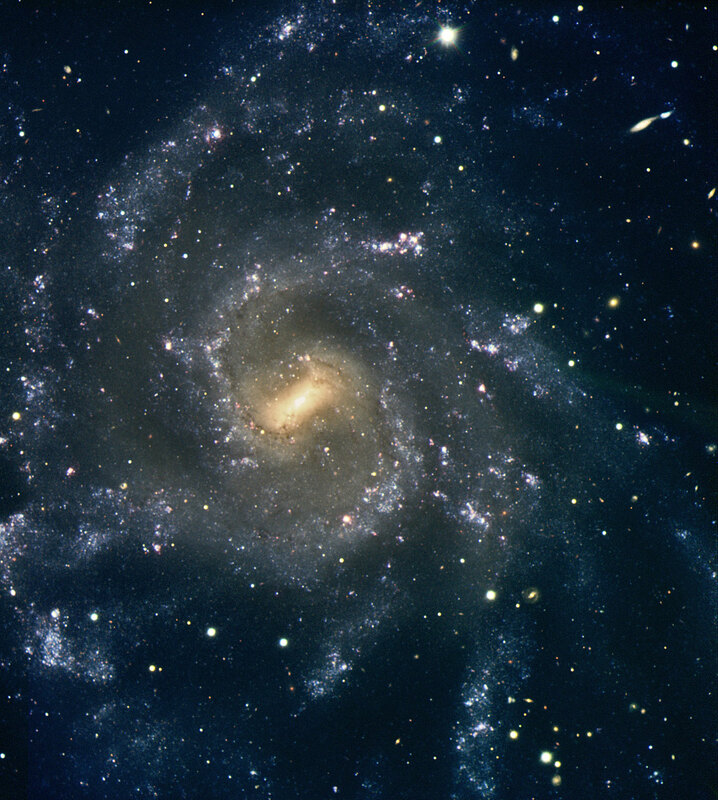 Very Large Telescope Takes Snapshots of Two Grand-Design Spiral Galaxies. The first image is of the impressive spiral galaxy NGC 6118 , located near the celestial equator, in the constellation Serpens (The Snake). It is a comparatively faint object of 13th magnitude with a rather low surface brightness, making it pretty hard to see in small telescopes. This shyness has prompted amateur astronomers to nickname NGC 6118 the "Blinking Galaxy" as it would appear to flick into existence when viewed through their telescopes in a certain orientation, and then suddenly disappear again as the eye position shifted. About 80 million light-years away, NGC 6118 is a grand-design spiral seen at an angle, with a very small central bar and several rather tightly wound spiral arms (it is classified as of type "SA(s)cd" ) in which large numbers of bright bluish knots are visible. Most of them are active star-forming regions and in some, very luminous and young stars can be perceived. 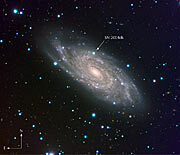 Of particular interest is the comparatively bright stellar-like object situated directly North of the galaxy's centre, near the periphery: it is Supernova 2004dk that was first reported on August 1, 2004. Observations a few days later showed this to be a supernova of Type Ib or Ic , caught a few days before maximum light. This particular kind of supernova is believed to result from the demise of a massive star that has somehow lost its entire hydrogen envelope, probably as a result of mass transfer in a binary system, before exploding. The second galaxy imaged by the VLT is another spiral, the beautiful multi-armed NGC 7424 that is seen almost directly face-on. Located at a distance of roughly 40 million light-years in the constellation Grus (the Crane), this galaxy was discovered by Sir John Herschel while observing at the Cape of Good Hope. This other example of a "grand design" galaxy is classified as "SAB(rs)cd" , meaning that it is intermediate between normal spirals (SA) and strongly barred galaxies (SB) and that it has rather open arms with a small central region. It also shows many ionised regions as well as clusters of young and massive stars. Ten young massive star clusters can be identified whose size span the range from 1 to 200 light-years. The galaxy itself is roughly 100,000 light-years across, that is, quite similar in size to our own Milky Way galaxy. By digging into the vast Science Archive of the ESO Very Large Telescope, it was possible to find an image of NGC 7424 taken on June 16, 2002 by Massimo Turatto (Observatorio di Padova-INAF, Italy) with the FORS 2 instrument on Yepun (UT4). Although, the supernova was already much fainter than at its maximum 6 months earlier, it is still very well visible on this image (see ESO Press Photo eso0436d). Spectra taken with ESO's 3.6-m telescope at La Silla over the months following the explosion showed the object to evolve to a Type Ib/c supernova. By October 2002, the transition to a Type Ib/c supernova was complete. It is now believed that this supernova arose from the explosion of a very massive star, a so-called Wolf-Rayet star, which together with a massive hot companion belonged to a very close binary system in which the two stars orbited each other once every 100 days or so (read the details in the paper by Ryder et al. here). Future detailed observations may reveal the presence of the companion star that survived this explosion but which is now doomed to explode as another supernova in due time. NGC stands for "New General Catalogue". Published in 1888 by J.L.E. Dreyer, this New General Catalogue of Nebulae and Clusters of Stars, being the Catalogue of the late Sir John F.W. Herschel contains 7840 objects of which 3200 are galaxies. Spiral galaxies take their name from the spectacular spiral arms that wind around in a very thin disc. Following the celebrated classification by American astronomer Edwin Hubble, spiral galaxies are classified into two families, so-called normal spirals (SA) and barred spirals (SB), and are further divided into types Sa, Sb and Sc depending on the opening of the spiral arms and the relative brightness of the central area. In barred spiral galaxies, the nucleus is crossed by a bar of stars at the ends of which the spiral arms begin. The (rs) in the classification testifies to the presence of an internal ring (r) surrounding the nucleus of the galaxy as well as to the fact that the spiral arms begin directly at the nucleus (s). Supernovae are classified into different types, depending on the appearance of their spectrum. Type II supernovae show the presence of hydrogen lines in their spectra while Type I lack this signature. Type I have been subdivided into Type Ia, Ib and Ic. Type I supernovae are all believed to arise in binary stellar systems. The first two images are almost-true colour composites based on images made with the multi-mode VIMOS instrument on the 8.2-m Melipal (Unit Telescope 3) of ESO's Very Large Telescope. In each case, exposures were taken in three different wavebands which were associated to a given colour: R-band (centred around 652 nm; red), V (540 nm; green) and B (456 nm; blue). The images of NGC 6118 were taken on several nights around August 21, 2004 when the observing conditions were somewhat unstable (seeing around 2 arcsec). The total exposure was 12.5 min in R, 25 min in V and 7 min in B. 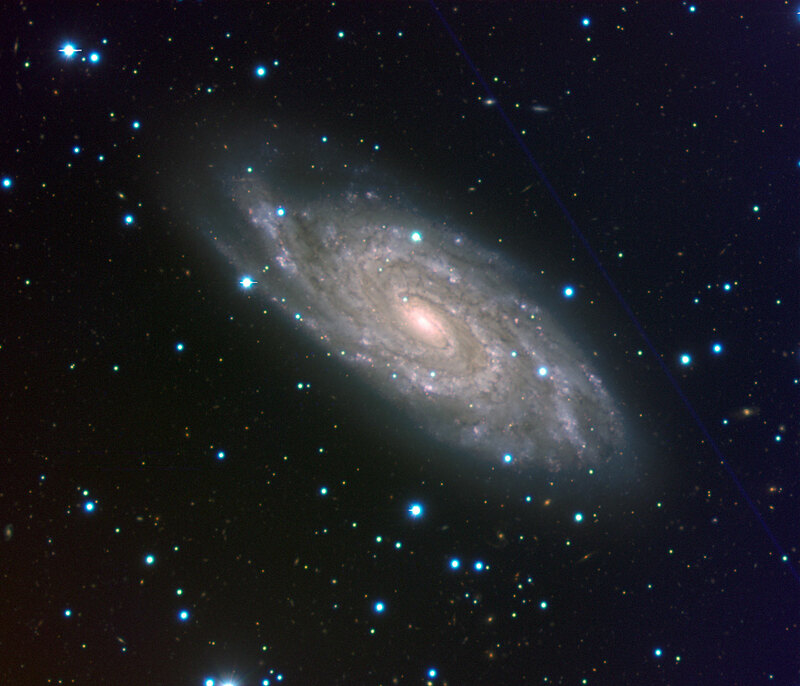 The images of NGC 7424 were obtained on the night of October 9, 2004, (around 4:00 am CET) when the conditions were good (seeing: 1 arcsec). The total exposure time was 7 min in R, 25 min in V and 10 min in B. The pixel scale is 0.205 arcsec/pix. All exposures were taken and pre-processed by ESO Paranal Science Operation Astronomers. Further image processing was made by Hännes Heyer (ESO) for NGC 6118 and by Henri Boffin (ESO) for NGC 7424. The classification of Supernova 2004dk was made by Ferdinando Patat and Giuliano Pignata (ESO) and S. Benetti (INAF, Italy) using data from the Calar Alto Observatory (Spain). The fourth image is a colour composite based on three FORS 2 images taken in the R-band (15 sec), V (60 sec) and B (90 sec). The images were obtained by Massimo Turatto for a large consortium of astronomers ("The Padova Supernova Group").